I know, I know — everybody has something to say about the five-day disappearance of South Carolina Governor Mark Sanford. It’s all over the media, and blog writers of right and left, pro and con, are salivating. Chris Cillizza has a review of the situation at The Fix in The Washington Post. 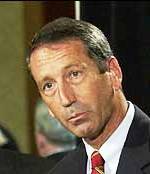 Sanford, probably a Republican presidential contender in 2012, recently made news by trying unsuccessfully to refuse to take federal bailout money for South Carolina. Whatever the Governor is doing, apparently it was more important than being with his four sons on Father’s Day. His staff says he’s been out hiking on the Appalachian Trail. Right. A news report says the state vehicle he left in was found at the Atlanta airport. What’s more, a federal agent saw him in the airport boarding a plane. There’s only one thing I’m really curious about — what’s her name? “More important than being with his four sons on Father’s Day” “What’s her name?” Wow, talk about unsubstantiated allegations! Latest reports are that the girlfriend is from Argentina. That’s where the Governor was for the past five days or so. See the news reports here, here, and here. Still don’t know what her name is, though. I’d like to see a picture, too. I wonder how she stacks up against Governor Spitzer’s paramour? Sorry, Harvey. When it looks like a duck, waddles like a duck, and quacks like a duck, it’s probably a duck. Now that he’s admitted his indiscretion its open season — yesterday was all speculation. “When it looks like a duck, waddles like a duck, and quacks like a duck, it’s probably a duck.” LOL! Gee Tom, that’s what I’ve been telling you about President (For life) Obama’s Democracy destroying (statist) agenda. It IS a “duck”!! Seriously though — your viewpoint on Obama is still the majority opinion so you’re right — at least for now. Sanford’s girlfriend’s name is Maria Belen Shapur, and she lives in Buenos Aires. A South Carolina newspaper, The State, has copies of e-mail messages between them. The paper says it has had the messages since December but didn’t publish them because they couldn’t be authenticated until now (pay attention, CBS and NYT). You can read them at the paper’s website, but don’t bother. Pretty boring stuff. What’s with these politicians — of both parties? They say power is an aphrodisiac, but this is getting ridiculous. I understand how these things happen, but the price for a public person who gets caught is pretty high. Truth is, I don’t think this is happening any more than it did in the past — there are just too many hungry journalists out there who long ago abandoned the idea that private and public lives should be separate.